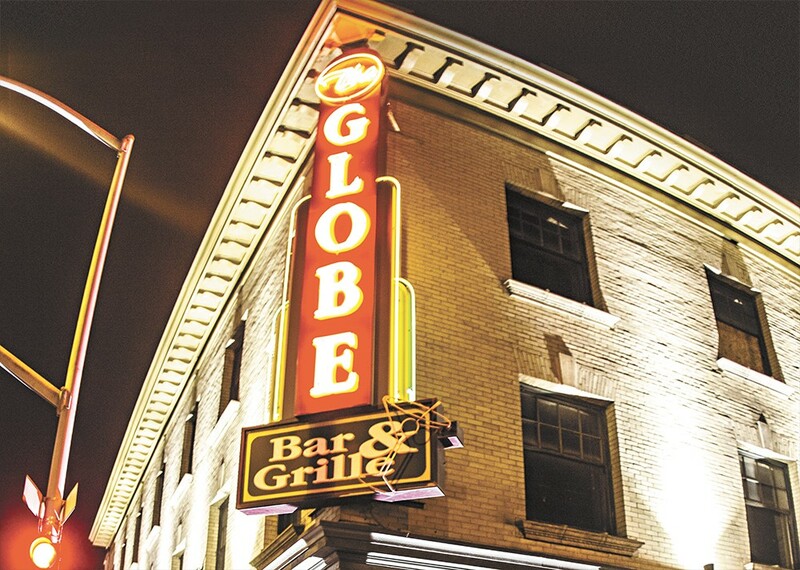 The Globe reopened this month with new owners after three years sitting vacant. The green-and-maroon sign towering over the corner of Division and Main marks a business that was a home-away-from-home gathering spot to many locals for 14 years. But during the past three years, the Globe Bar & Grille sat vacant. Walk inside now, and someone who used to frequent the Globe won't recognize the thoroughly redone restaurant that debuted with new owners late last month as the Globe Bar & Kitchen. "If anyone is expecting it to be like the old Globe, it's completely different. It's just in the same spot," says James Fountain, who opened the Globe Bar and Kitchen with his longtime friend Ryan Bates and Bates' fiancée, Dianna Dahlgren. Fountain and Bates also own the Blind Buck cocktail bar next door, which is all part of the Globe building, built as the Globe Hotel around 1908. The two were interested in the old Globe when they first started their bar, but were wary of opening something big too soon. After seeing the success of the Blind Buck over the past year and a half, they decided to go for it. "It was available, and this is something that we always wanted to do — introduce food and have space," Fountain says. Over the course of six months they gutted and completely remodeled the Globe. One of the main goals was widening the interior in order to build a square bar in the center to make the atmosphere better for socializing, says Fountain. The bar seats about 50 people and 12 TVs hang overhead. On Saturdays, you can watch them and catch Dahlgren as Monster Energy's Miss Supercross, presenting the races on FOX Sports. Including the bar, booths and black tables surrounded by cushy stools, about 170 people can sit. At night, the restaurant ambiance transitions to a lounge feel, with DJs, bottle service and space to dance in the back. Local artists added to the décor with metalwork and a vintage sign painted on the brick. With all of the changes (the only thing kept was the tin ceiling), the owners made sure to get the previous owner's blessing to carry over the Globe name to the new business. "Because it was a staple, because people do know it, because it is the same location, because we have the classic historical sign [and] the building is still called the Globe ... I didn't want to fight it," Fountain says. "I want it to be the same place that people knew, just grow it into today." Josh Vrieling, manager of the Blind Buck, remembers the Globe in its former life as a pub, a grungier place to shoot pool and eat good food, with a lot of regulars who were restaurant workers around town. One of the chefs, named Howard, handed out questionnaires to find out customers' favorite ingredients and made up meals for them on the spot. "We'd get together big old groups and he would just make up these big old spectacular meals just based off of whatever we wanted," says Vrieling. "It was kind of fun like that." 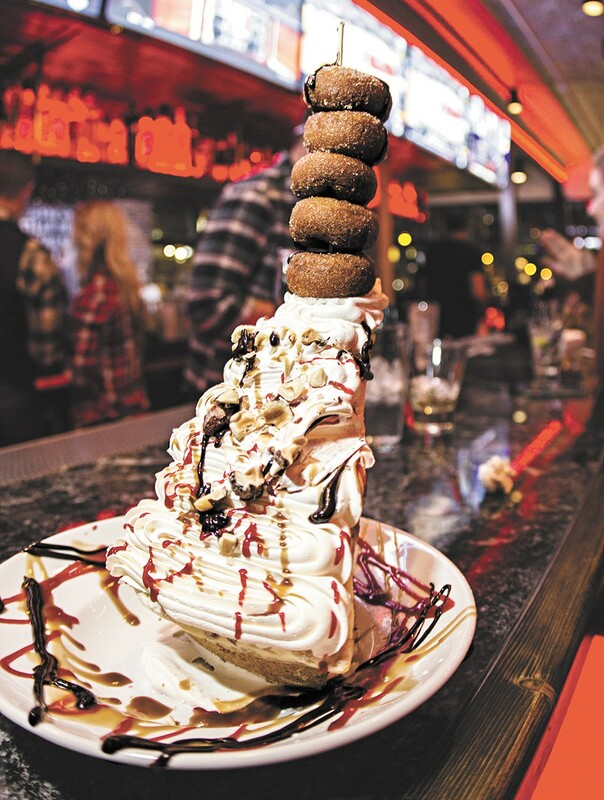 The Globe Bar and Kitchen's Mile-High Donut Pie. Today, chef William Webster, at the kitchen's helm, has created a menu of gourmet bar food. You can share plates like crispy green beans, Hawaiian sliders or three types of wings. The salads offer choices like wild mushroom steak or chicken confit Caesar. Fork-and-knife plates feature potato-crusted salmon and ginger teriyaki stir-fry, or grab a handheld, such as a Reuben or a monte cristo stuffed with turkey, ham, cream cheese, Swiss, smoked Gouda and blueberries. The 24 taps pour both big names and local brews, and the bottle selection offers global choices from Mexico, Italy and China. Fountain says for the cocktails, they wanted a creative, yet solid menu. The Cheesy Tini has blue cheese-stuffed olives with your choice of vodka or gin, the Pear-fect Mule adds pear vodka to the classic Moscow mule, and Gin N' Juice combines Tanqueray with aloe juice. When the Globe was reborn, Vrieling says it meant wiping the whole slate clean and starting over.